Associate Professor of Nursing Barb Pesut (left) has won the grand prize offered in the 2012 Okanagan Campus United Way Campaign: use of a Lot A parking stall (stall number 1) for next term. 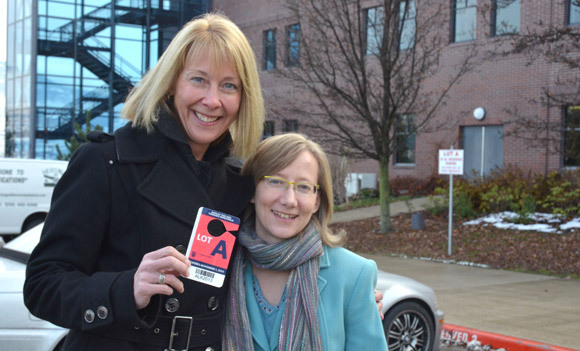 Campaign Chair Sarah Stang presented the coveted parking pass last Wednesday afternoon. As of last week, the Okanagan campus United Way campaign had raised $43,855 and contributions are still coming in. Anyone wishing to show their support can still do so until the end of December, reminds campaign Chair Sarah Stang. The final total will be announced on January 25, during the Ceremonies and Events/University Relations Friday morning Pit Stop. To find out more visit the Okanagan campus United Way campaign website.